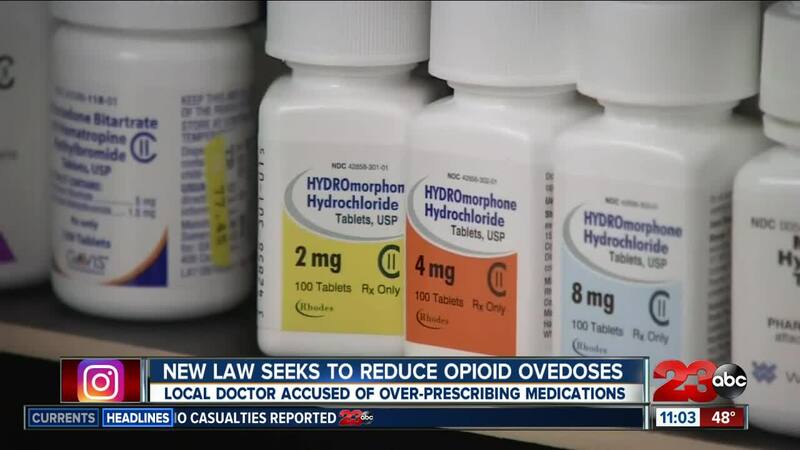 DELANO, Calif. — A Delano doctor has been accused by the Medical Board of California of gross negligence and excessive prescribing of controlled substances after the death of a patient in 2013. Accusation surfaces as new state bill requires physicians to prescribe the overdose reducing drug Naloxone for high-risk patients. According to the complaint, Dr. Sadegh Salmassi began treating and prescribing controlled substances to a female patient as early as 2010. From 2012 to 2013, Dr. Salmassi would allegedly see the patient once a month between 2012 and 2013. Dr. Salmassi would also allegedly prescribe the patient multiple controlled substances, including methadone, oxycodone, and depressants. In August 2013, Dr. Salmassi allegedly treated the patient twice over the course of two weeks. During her last visit, which took place on August 27, 2013, the patient was prescribed methadone. The patient filled the prescription the same day as her visit, and died the next day on August 28, 2013. According to the complaint, the Fresno County Coroner investigated her death and determined the patient died of "acute intoxication due to combined effects of tricyclic antidepressants, methadone, and zolpidem." The complaint says her death was ruled an accident. Dr. Salmassi is also accused by the Medical Board of California of failure to maintain adequate and accurate medical records. According to Dr. Salmassi's website , Dr. Salmassi is a "aesthetic specialist" in Delano.